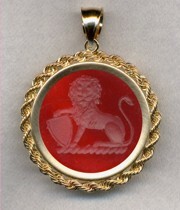 A centuries old tradition kept alive by Heraldica Imports. Fast three week delivery! Satisfaction Guaranteed! 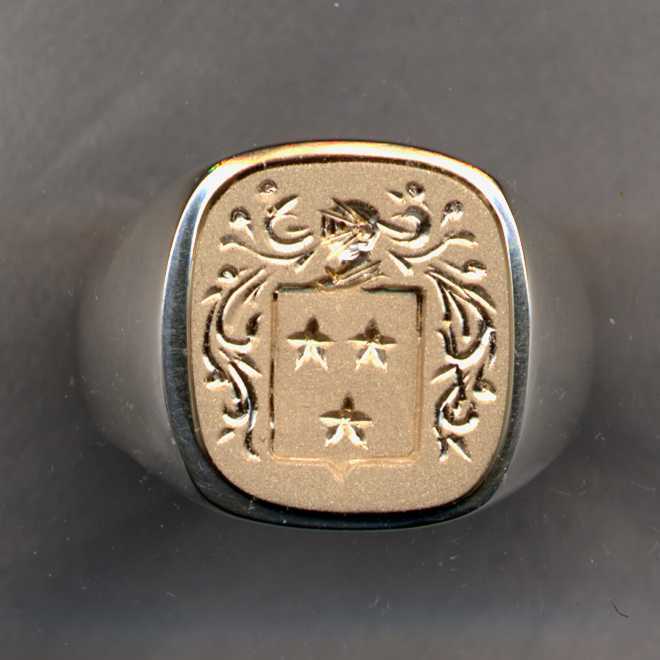 "Clarity, Quality, Choice, Price and Service"
Enter your surname (last name) and click to see a collection of rings and other jewelry with the family crest for your name. 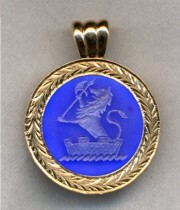 All of our jewelry is hand engraved with your family crest! 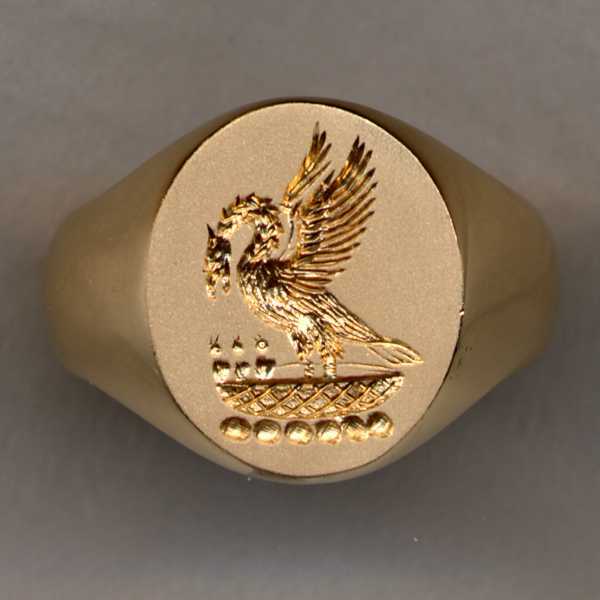 Would you like to have an inexpensive hand engraved family crest ring? If so, see our Ring Hospital section for more information. Testimonials: See what our customers have to say! 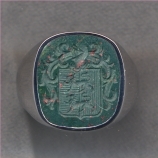 An example of a Family Crest Ring in Bloodstone. 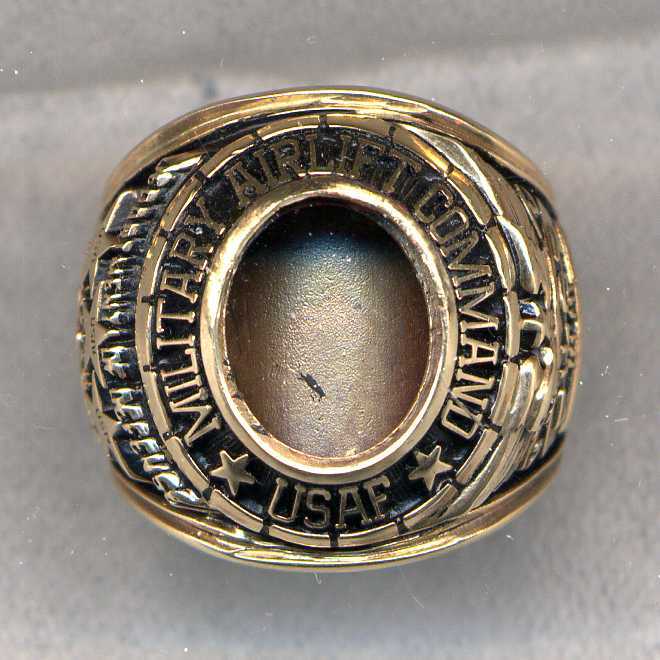 Sterling Silver ring #18SS for Jenkins. Gold ring #23 for Myers. 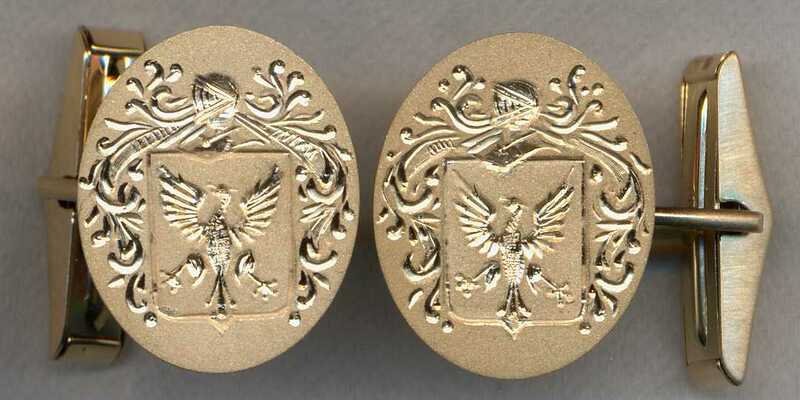 Gold Family Crest Cuff Links. Our Wedding Band. Call for information! 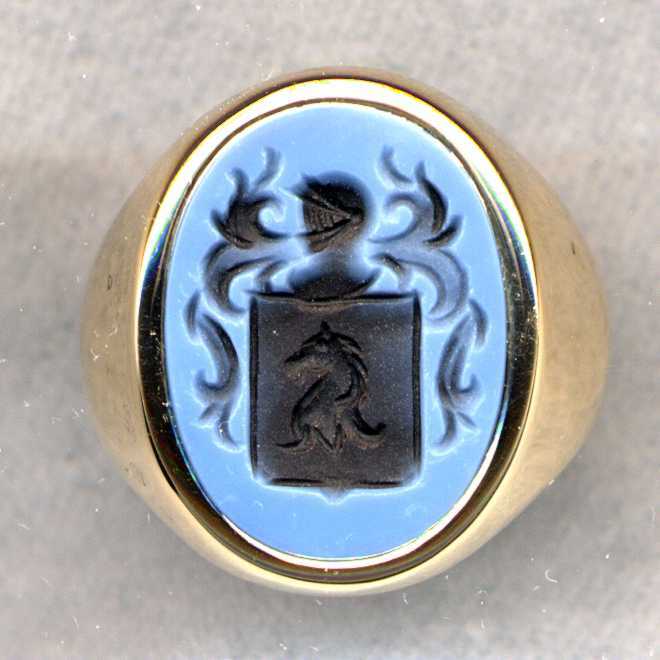 A man's Stone Family Crest Ring. 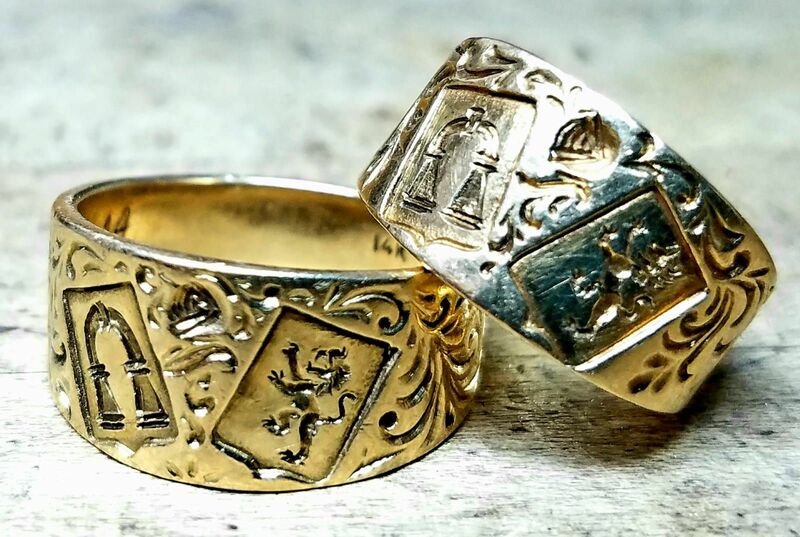 All our rings are intended to be hand engraved with your own family crest. This can be done either from your own artwork or from the one found by searching our database above. 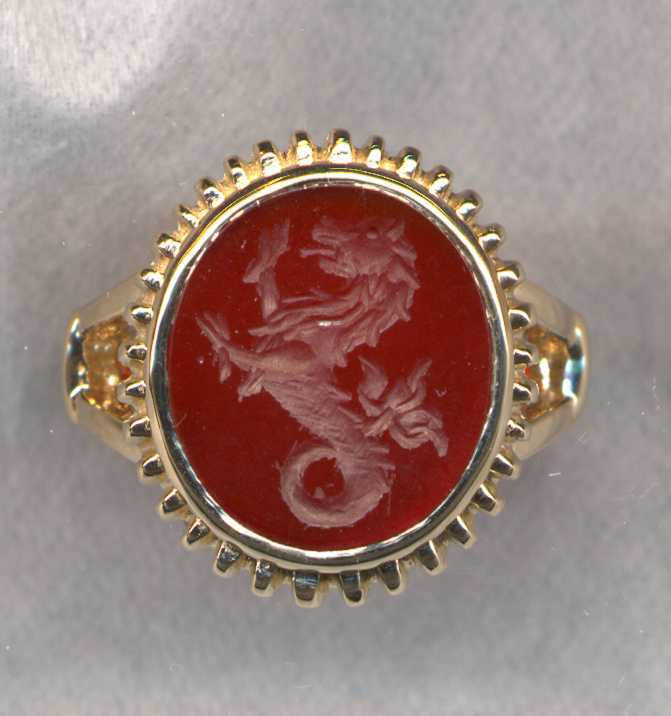 Just choose a model, specify gold or silver and if a stone ring, the kind of stone you would like. 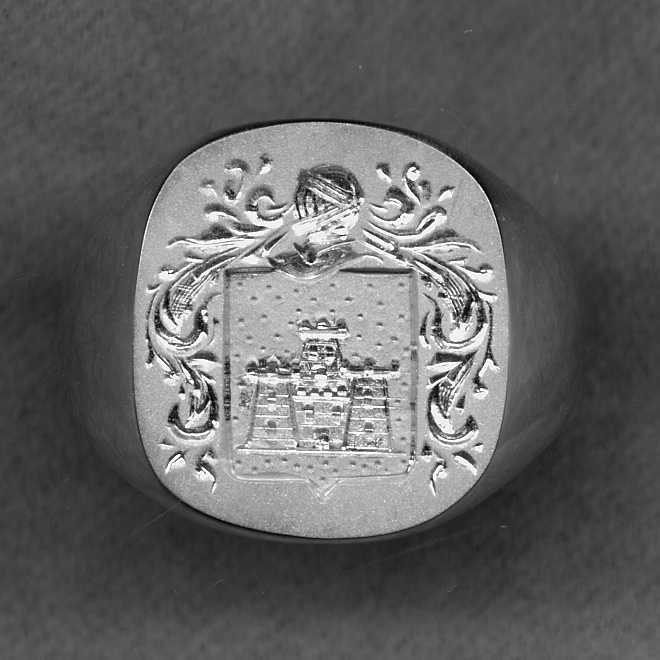 A Crest Stone Ring from our Silver Collection. See our Gold Buying Service: this lets you trade your old gold towards your new jewelry! 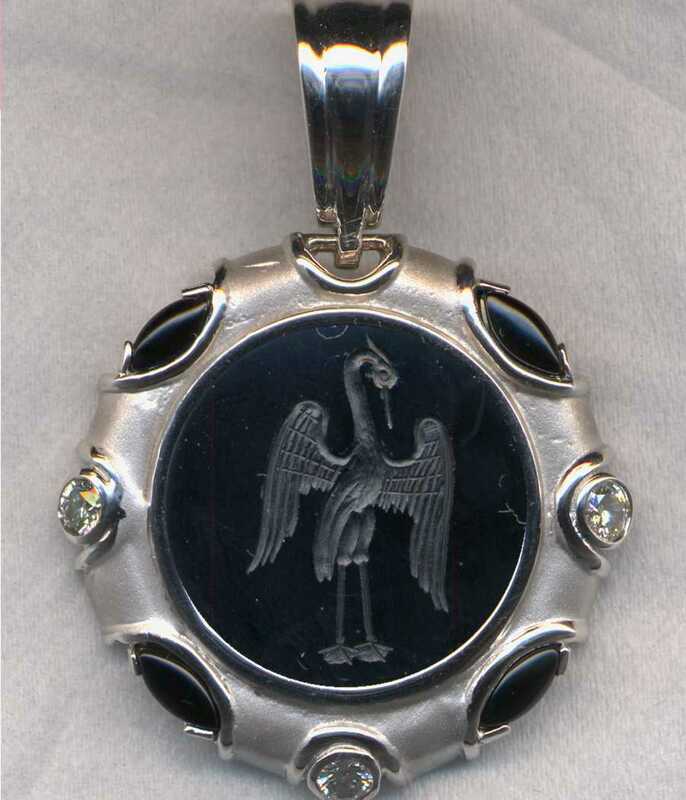 An example of a Mythological Pendant in Black Onyx and white gold. 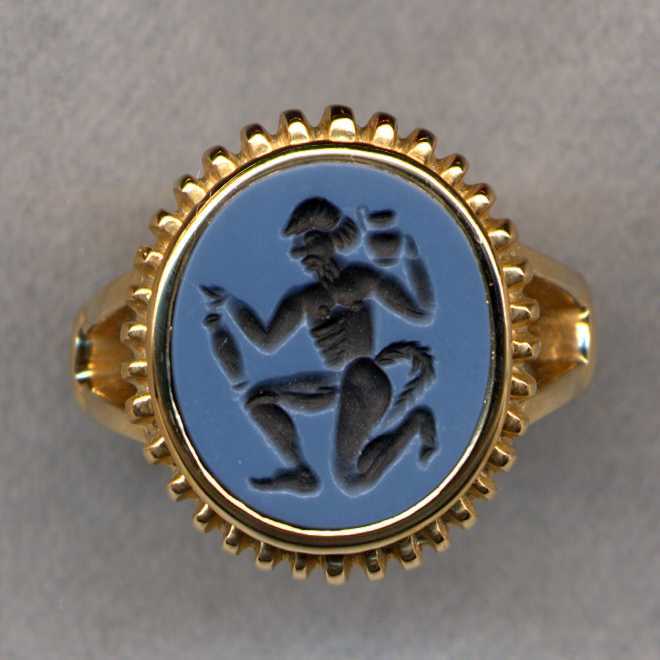 An example of a ladies' Mythological Ring in Bicolor Agate. 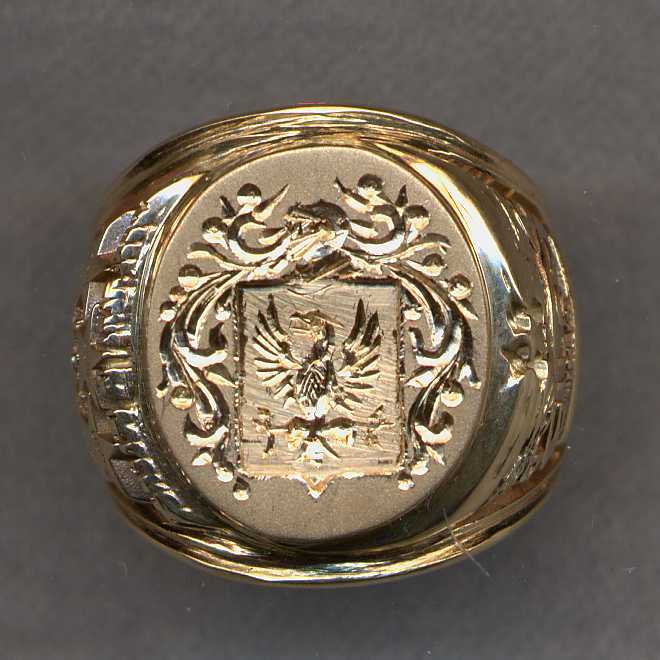 An example of a man's gold Family Crest Ring. 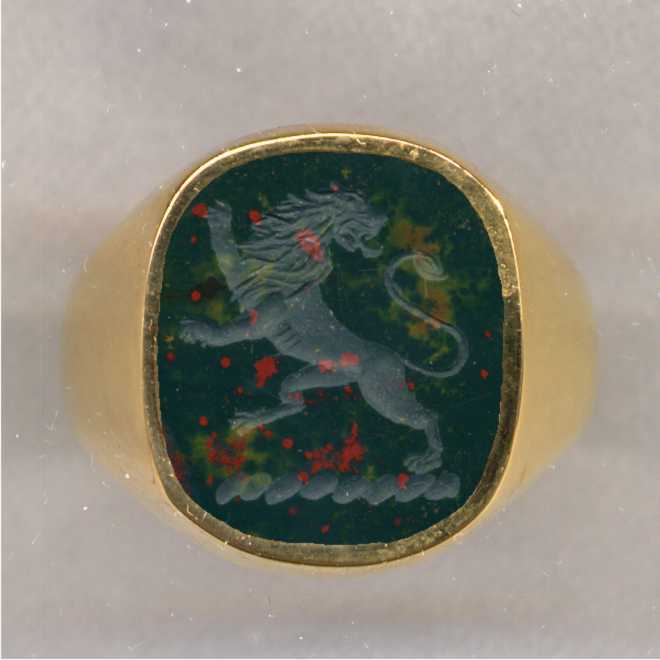 An example of a man's Family Crest Ring in Bloodstone. Our engraving is totally done by hand to order - no strings attached. 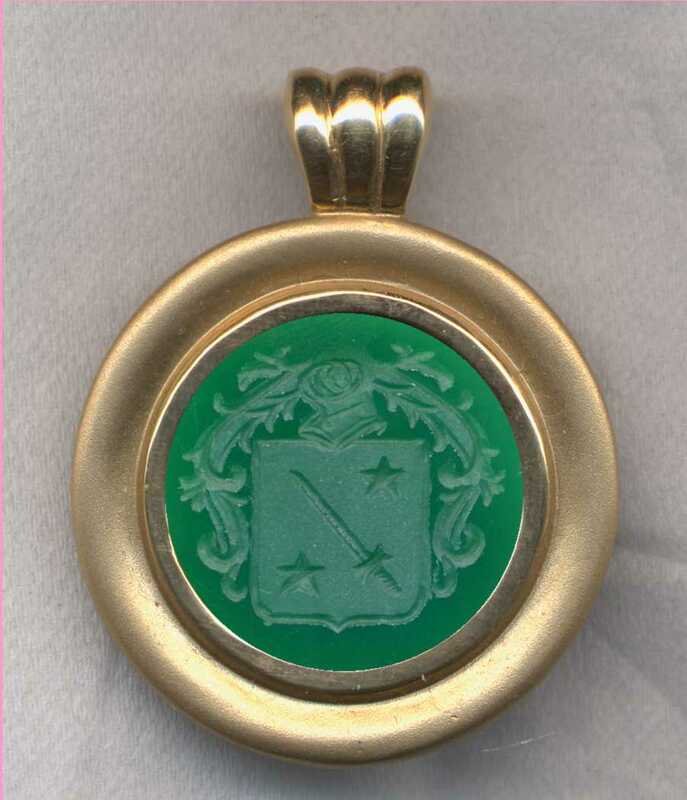 If you do have a crest, send a copy to us with your order and that is what we engrave! 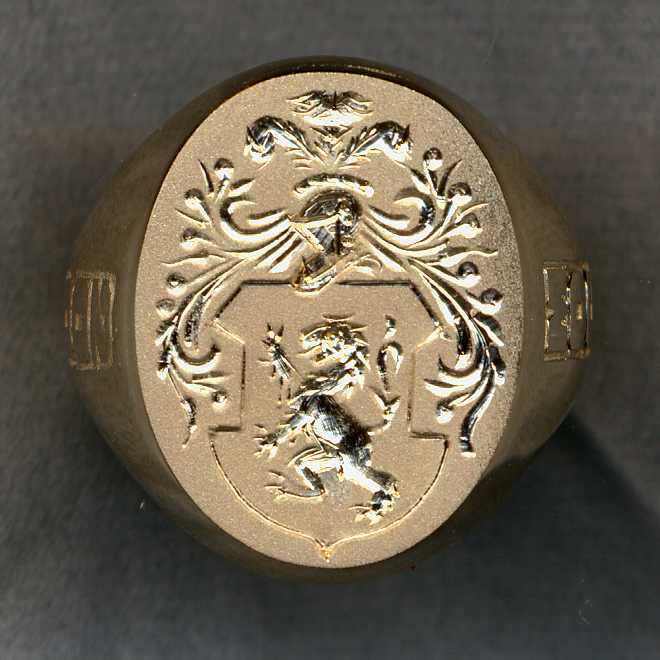 Or, if you wish, we will be happy to send you a proof of what your own crest would look like on the ring of your choice before you place your order! Just give us a call and e-mail us a copy of the crest! 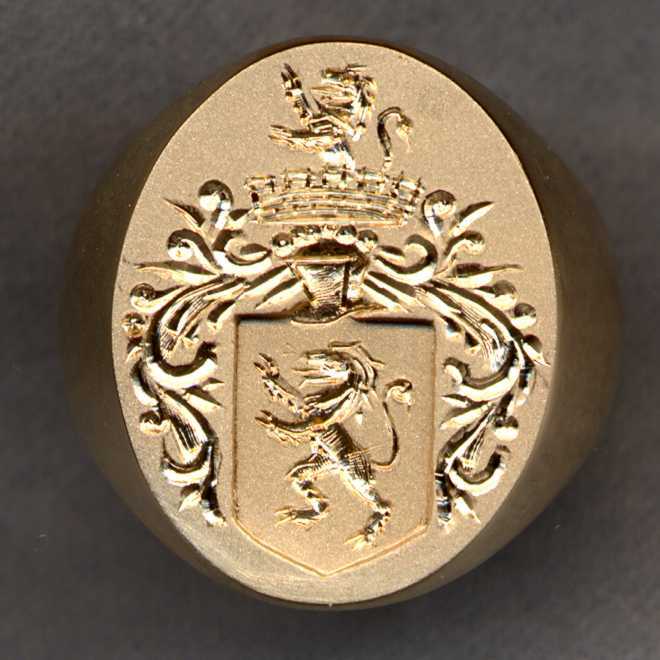 At Heraldica, there are no extra charges for engraving exactly what you want! 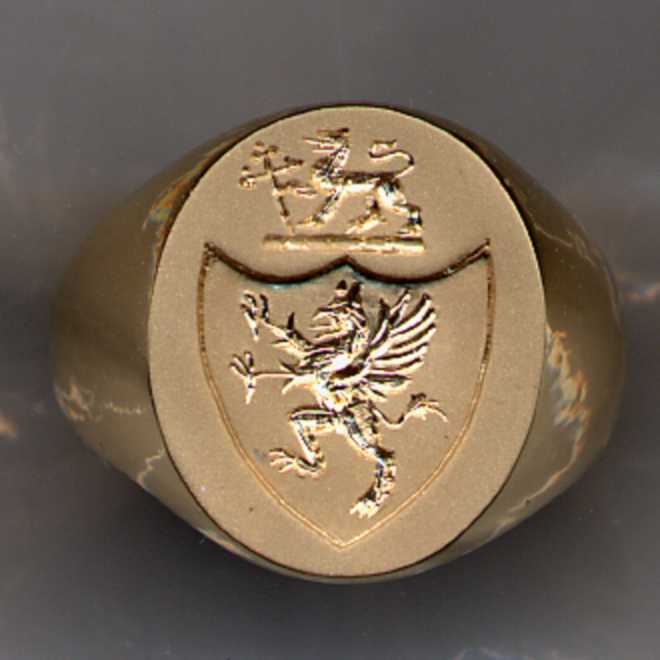 We can also engrave your family crest on your own gold ring or stone ring. See our FAQ page for more details. 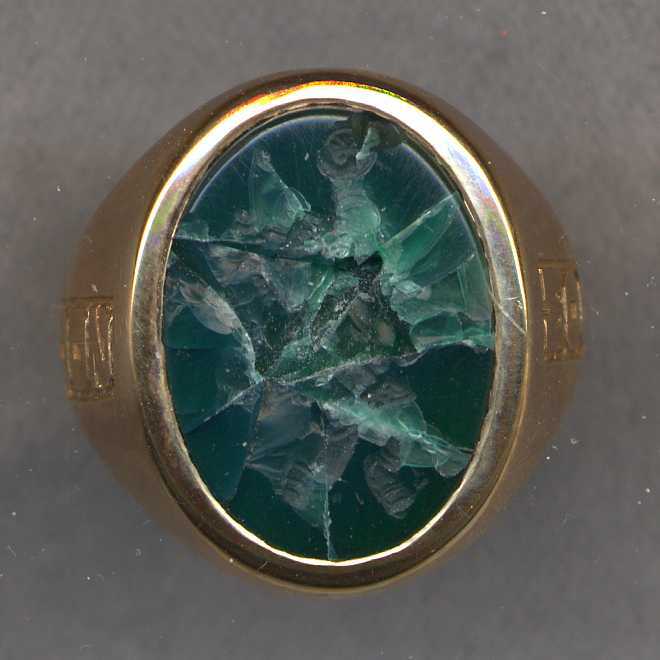 A man's stone crest ring in Bloodstone. 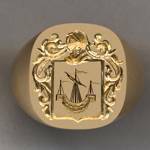 A ladies' Stone Crest Ring from our 2700 Collection. 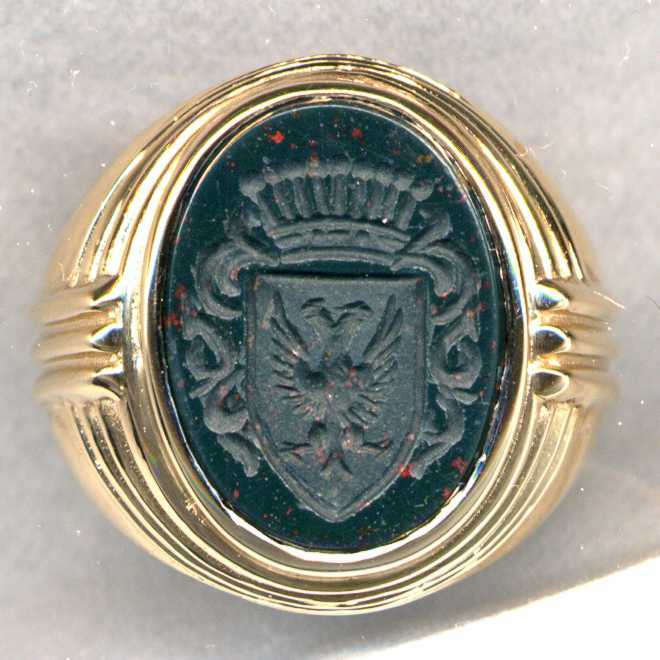 A man's ring with the Coat of Arms of Argentina. 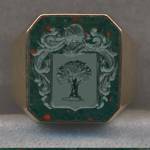 A Ladies' Monogram Ring in Bicolor Agate. 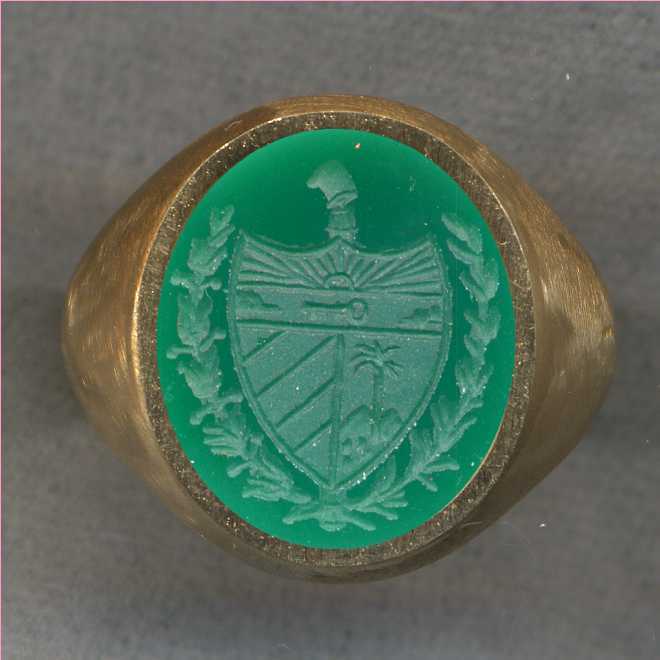 A man's stone ring with the Great Seal of the United States. 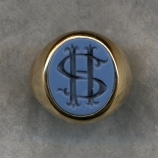 A man's stone ring from our Monogram Collection. 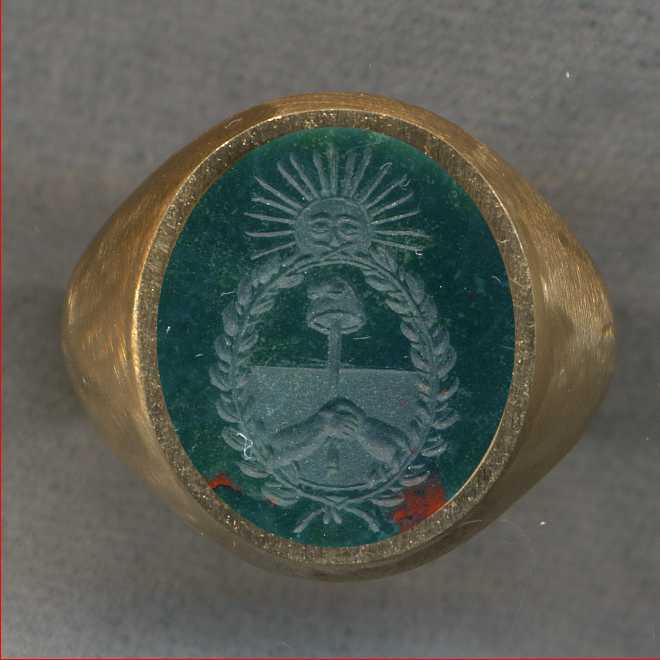 Another man's ring with the Coat of Arms of Cuba. Please take a little time to examine this website carefully so that you will have a full understanding of your many options when ordering our products and services. 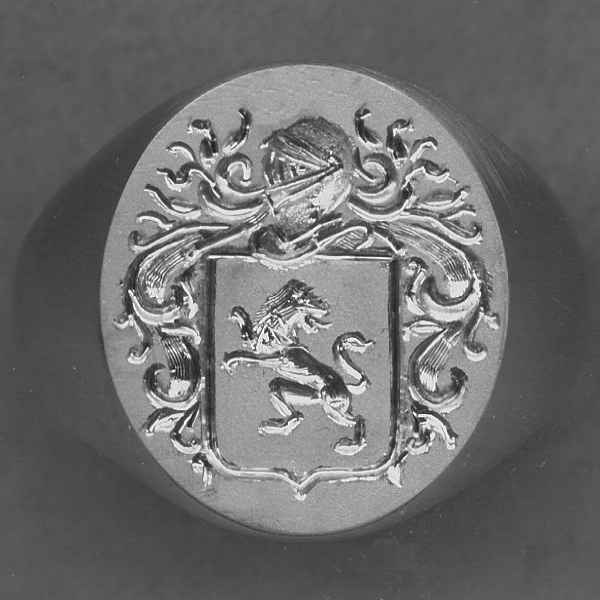 A man's Crest Ring from our Silver Collection. 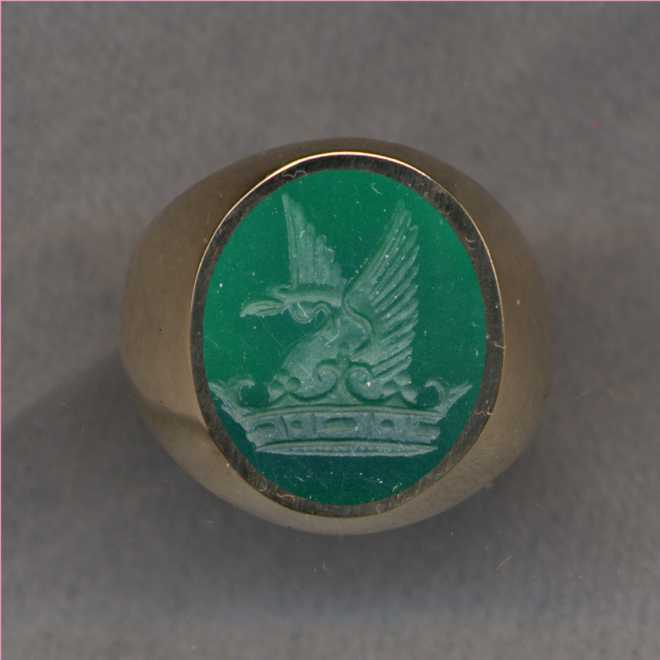 A ladies' stone Crest Ring. 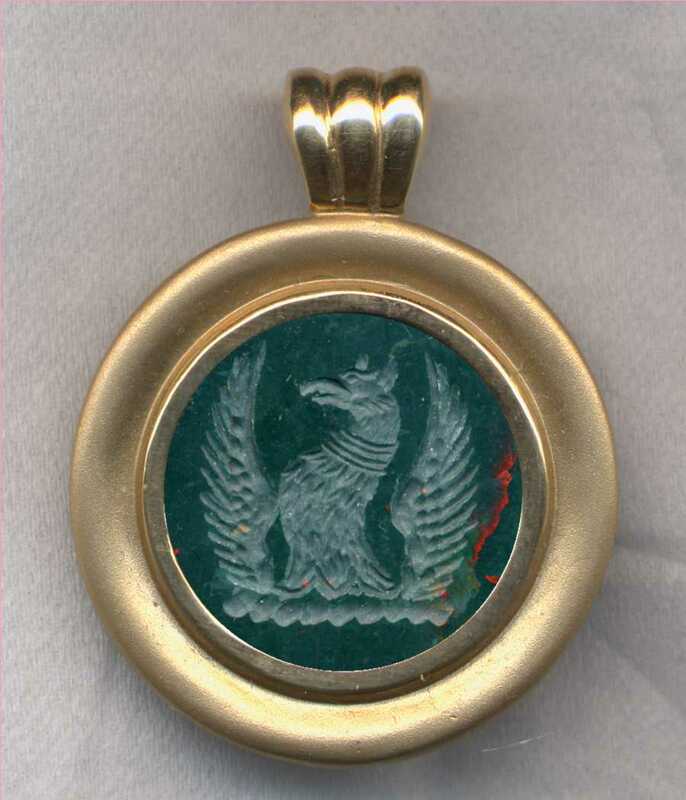 A stone (Green Onyx) Crest Pendant. 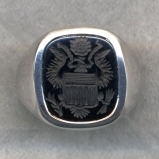 A two tone men's Family Crest Ring. 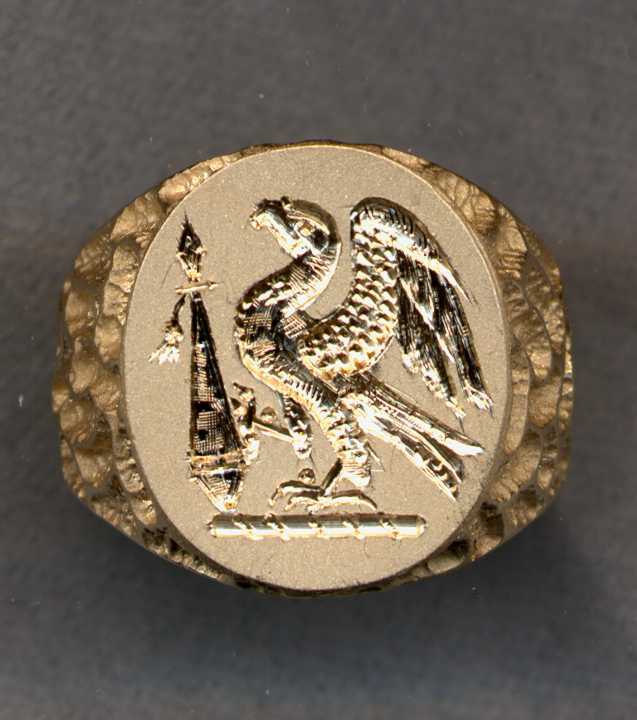 Be sure to see our Gold Ring, Stone Ring and Stone Pendant Collections of Crest Jewelry. 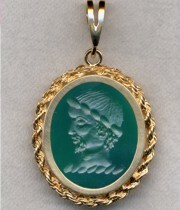 Also take a moment to visit our unique Mythological Rings and Pendants. Before and after photos from our Ring Hospital Service. Our belt buckle from our Silver Collection. More before and after photos from our Ring Hospital Service. 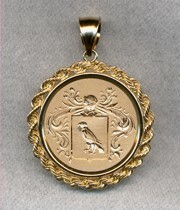 All of our jewelry is Hand Engraved by our European trained Master Engravers. 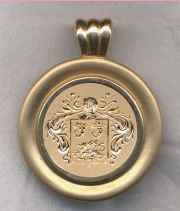 Our main business is the engraving of a Family Crest (also known as coat of arms, heraldic motif, heraldic art or armorial drawing). 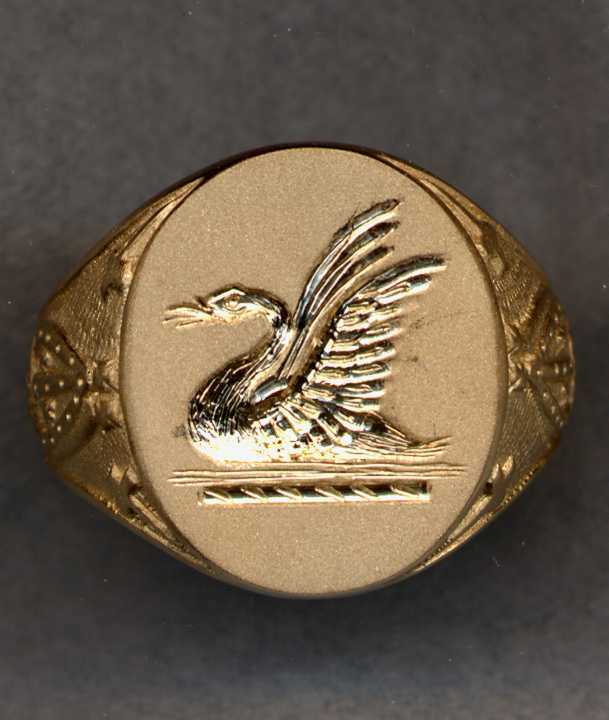 Because all work is done by hand, Heraldica can also engrave almost any subject on your ring or ours such as company logos, fraternal emblems, college seals, zodiac signs, civic association designs, civic arms (such those of a city), insignias, lodge emblems, national coats of arms, military emblems, art engravings or reproductions, religious figures, family association logos, Scottish Clan emblems, etc.